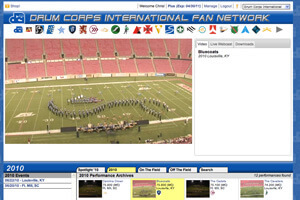 Video On Demand from the June 22 Drum Corps International Premier Event in Louisville, Ky., is now available for playback on the DCI Fan Network. You can watch the performances of Bluecoats, the Cavaliers, Phantom Regiment, Glassmen, Madison Scouts, Teal Sound and Pioneer in their entirety, at the click of a mouse button. Watch video on demand from Ft. Mill, SC.